Spit-Braai King does more than just lamb spitbraai’s. We have experience in the catering and hospitality trade. 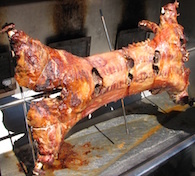 Being in the catering trade for 35+ years we have done spitbraai functions on boats at sea, on the top of Table Mountain, in caves, on top of buildings and many more. We versatile we are flexible to your needs. Following our win recipe we promise our customers great food! We can do traditional braai’s. Over the fire, meat cooked perfectly the traditional South African way. Great menu! Want the steakhouse feeling at home/work? Try our Steak/Chicken Grill. We make THE BEST Steak (350g A-Grade Sirloin) on a charcoal grill! Served with a proper pepper sauce and sides. Order menu in advance and we will mature your steaks. We can do chicken for the people that don’t eat red meat, our grilled chicken is truly famous! 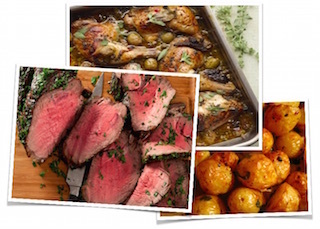 Roast Beef & Chicken: This menu has taken off and has done tremendously well. 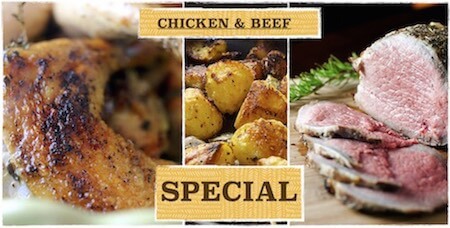 Roast Beef and a Chicken pice served with three salads and we add a FREE Starter AND FREE dessert. Great for weddings. New kid on the block our Banting menu. NO Sugar & No/Low Carbs. Budget Options: Great for lunch and in-between meal at teambuilding or sports events. Plug the hole and keep going with some great food! Lamb what a versatile type meat, we just love it! A old-time favourite the Lamb Potjie/Stew. A new menu but an old school fav here at our head quarters, Lamb Pie. Name a place that still makes REAL LAMB PIE! Our pies are packed full of meat enclosed in a flaky and crispy pastry! Hhmm Lunchtime Knockout winner! TIP: If you live near our HQ in Somerset West, you are more than welcome to pop-in and see what we have to sell. Famous Pies, Lappies wors (really really good sausage) chops, Lappies sauce, charcoal, blitz, patties. Note: All items are subject to availability. Please have a look at them above or contact us and let us know if there is something specific you would like. We would love to help! We can create a special & custom menu for you.